61946 PER5160.jpg 500X638\PER5160.jpg 61947 PER5160_Zoom1.jpg 500X638\PER5160_Zoom1.jpg 61948 PER5160_Zoom2.jpg 500X638\PER5160_Zoom2.jpg Send A Hint! 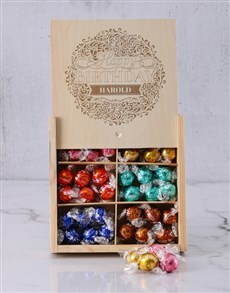 The personalised thank you gourmet gift a bouquet of taste. 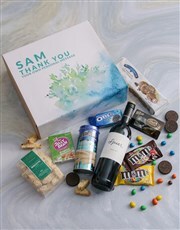 This personalised gift snack box is white with a beautiful water painted bush of blue flowers and a blue stain. The text is a blue with ‘Thank You’, their name and a personal message. 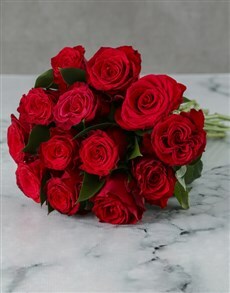 The edible gourmet gifts that act as floral centre pieces include Almond Biscotti, Chocolate Chip Cookies, Tropical Jellybeans, Extra Dark Lindt, Original Oero, Chocolate and Peanut M&Ms and a bottle of Spier Merlot. 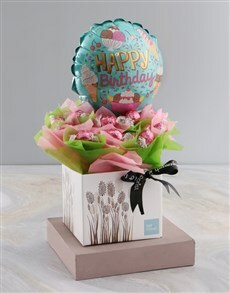 Get this Personalised Thank You Gourmet Gift delivered with NetFlorist.